My puzzle is almost finished. I have a small mistake and have been searching for it. I have had silence in the house to concentrate, my husband left fishing with Piitu. We don't do that regularly but my sister's husband is an avid fisher and they have the fishing net often floating in the sea. This time my husband went with them to install the net and it is not so easy because of the ice. It is about -5 degrees Celsius now, but we have had colder for the whole week. Piitu was so full of energy and excited to run around totally free. Here is the hole. The twigs have covered it so that other people would not walk in it by accident. Hannu is sawing the hole open. The drill holes are made first and then the borders sawn. There is new ice since the last visit. The net is installed with Härveli (trademark, the name would be in English contraption, device, gadget... I would prefer the last one). 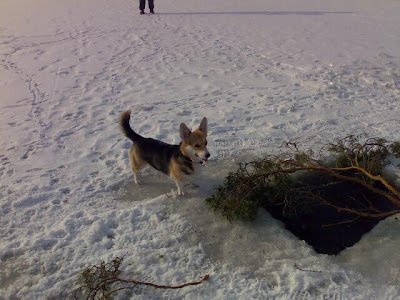 It goes under the ice and will be dragged with a string. The device is easy to identify because of the sound it makes when the thorns bite the ice. Here are 2 pictures from the manufacturer's booklet. The device can be dragged back from the starting hole or it can be taken out from a new hole sawn where the device ended. 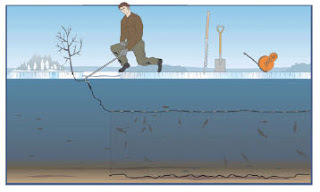 After that the net is pulled under the ice using the string Härveli left in the water. Now the net is in place and we are waiting for a good draught. I just love it when you share things about your life in the cold. I like the details of how you set up the fishing. In my part of the world we don't get snow. If we do, it doesn't last long so we really try to enjoy it. Ya' know, like building sad looking snowmen...if we even get enough powder. How you live all the time is interesting to us because it is SO vastly different from what we experience. I also think we should make it a regular habit to share with our children how other people live and work in various parts of the world. Piitu is cuter than ever! Thank you very much! One of the reasons I am sharing these is that I have realized my life being actually exotic to many people. It's funny because I never thought like that before. Now I have very many friends all over the world and I am trying to convince them to visit Finland some day. You are right, children should know about other countries and habits but I think they have a much better chance nowadays because people can link to each other over the Internet. I learned a lot in school about all places but my impression about Israel was something totally different from what I saw and experienced. That was one of the reasons I had to take my children there last summer to see it.